Have you ever pursued something for decades, hoping and praying that success will find you? Well, that is what Robert Cole did. He spent 30 years putting in for a tag for a bighorn sheep in the Bitterroot’s 270 hunting district, and this year, Robert’s name was drawn. He is a retired engineer who spent more than 25 years working at Missoula’s Community Hospital. He and his wife currently also own property down the Bitterroot and are planning to move down there at some point in the near future. Robert went out ram hunting with his buddy that was elk hunting in the same area. They had gone their separate ways for the time being, and planned on meeting back later that day. Robert knew this drawing was a once in-a-lifetime opportunity, so he was going to make sure he got a good ram–he was going to be picky. After doing some scouting, he came across some ewes and a few rams. One of the rams was quite large and he knew that was the one he wanted. From close to the bottom of the mountain, Robert took a shot uphill from around 125 yards. The second shot dropped him in his tracks. He literally rolled from half way up the mountain all the way down to a nearby road. 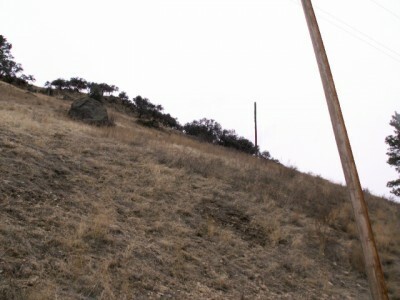 See picture to the left to see how steep the mountain was. Robert couldn’t believe it! He went back and got his truck and drove right up to his first bighorn sheep. 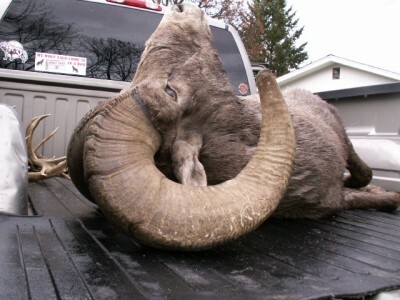 He had gotten his prize 270 ram, and when his buddy returned, they gutted the massive ram. No more than five minutes went by before a former co-worker of Robert’s, from Community Hospital, randomly showed up and congratulated him and helped them drag the ram the whopping five feet into his truck. Keep in mind that Robert is approximately 5’2″ and weighs no more than 95 pounds, so the fact that everything worked out the way it did has to be chalked up to fate, right? This ram was meant to be his. 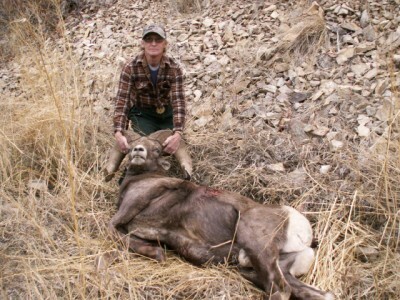 Robert decided to get a full body mount of his bighorn sheep from a local taxidermist down the Bitterroot. He was told that his ram is roughly estimated to score somewhere around 180, which makes him a really good ram. The mount is scheduled for completion by June of 2013.